In the early days of instant messaging, the two messengers that have stood out are Yahoo Messenger and AOL Instand Messenger, which back in late 90s taught us to chat pulling the plug on texting. As one of the pioneering chat app, AOL Instant Messenger had dominated online chat in North America. But now, social apps like Facebook Messenger and WhatsApp has conquered, AOL is giving up the fight and shutting down its Instant Messenger after 20 years. We know there are so many loyal fans who have used AIM for decades; and we loved working and building the first chat app of its kind since 1997, Our focus will always be on providing the kind of innovative experiences consumers want. We’re more excited than ever to focus on building the next generation of iconic brands and life-changing products. While AIM iconic Away Messages were the initiator of the modern tweet and status update, with competitors like ICQ, and messengers from Yahoo and Microsoft MSN. But Google’s GChat, WhatsApp and Facebook took over, as AIM never fully made the shift to mobile, as the chat experience was built into AOL desktop. 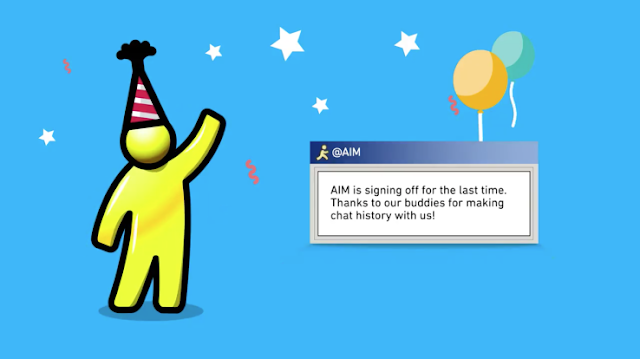 Farewell to AIM, those teenage memories will continue to linger!